ATS specializes in injection molding of complex, high precision advanced ceramic parts. Over the years ATS and EverFab have developed unique tooling components and processing techniques that allow us to produce high performance products with very tight geometric tolerances. At ATS we have learned never to underestimate human innovation. When others respond with "can't," we look at it as an opportunity: an opportunity to advance injection molding, mold design, tool construction, and advanced ceramics. Use the tabs on the left to learn more about our capabilities or click the link below to contact us. No part is too small. ATS has invested in equipment specifically designed to mold micro-parts in any of our hundreds of feedstock. The image below contains several micro-parts molded at ATS; the smallest of which weighs only .010g. 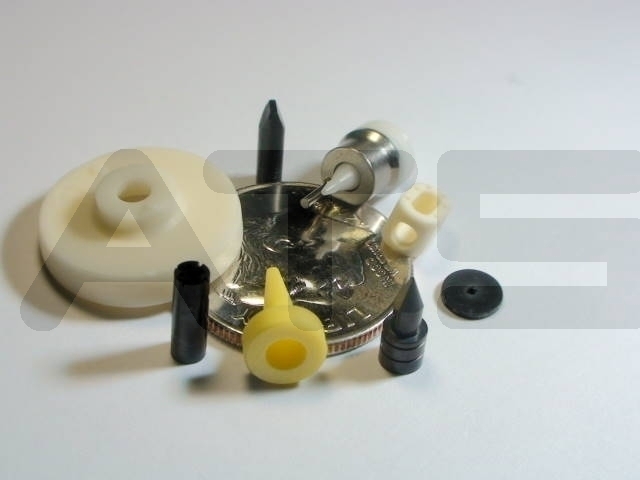 This image illustrates just some of the many micro-components molded by ATS in high volume. Most of these parts would be very difficult at best to machine from advanced ceramic and would certainly be more expensive. Bring ATS your micro-component challenge and see what we make possible! Call us or use the link below to contact us! ATS has the capacity to mold parts up to 5 kilograms using any of the dozens of feedstock produced at ATS. Our proprietary formulations allow us to tailor the behavior of a feedstock to suit a part's geometry and size. The image below illustrates a nose cone molded from fused silica and is an example of our capabilities for large parts at ATS. This part is 330mm tall, 140mm in diameter at the base, and weighs 2.4 kilograms. Bring us your "biggest" challenge! An excellent example of ATS's ability to meet tight tolerances is illustrated below. 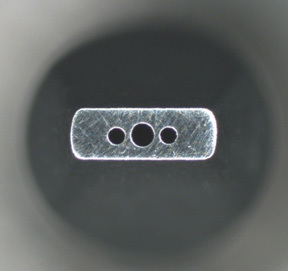 This image is the working end of an as-molded alumina optoelectric connector with a 127um hole. What's unique about this part is the precision required. The hole has a size tolerance of ± 3um. The concentricity specification (ID/OD alignment) is 3um. ATS has molded thousands of these parts with a zero fallout for size or concentricity. ATS has state-of-the-art vision measurement equipment that allows us to certify the dimensions as specified. ATS was molding a very small part (.005 cc) for years before our customer asked us to improve a geometric feature to enhance the performance. 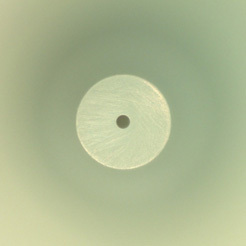 The inside diameter alignment to the outside diameter (concentricity) at the functional end was tightened from 25um to 12.7 um. ATS engineers designed and EverFab built a unique component for the tool which allowed us to adjust the alignment and "zero it in." We now hold <5um alignment and have delivered thousands of parts meeting that specification. 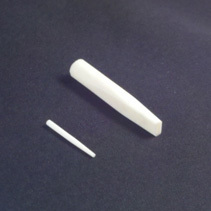 The image below is an example of the aluminum nitride component described above. Another geometric tolerance that demonstrates our expertise in mold construction and innovation is true position control with small holes. 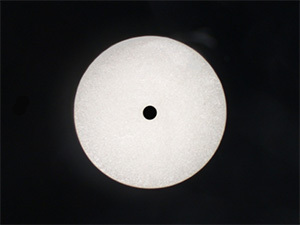 The image below is an example of a black zirconia part made by ATS with small holes in the tip that have true position tolerances of less than 25um. These parts are molded in high volume at ATS with zero fallout for true position and demonstrate our ability to produce small, tight tolerance parts repeatedly. ATS and EverFab have integrated many innovations into our molds over the years which have allowed ATS to produce advanced ceramic solutions where others have failed. We have been willing to push the envelope within the machining, mold construction, and design aspects of tooling which has resulted in world class geometric control. Give ATS a chance to solve your most challenging needs. Aspect ratio is the relative size of a feature in two different dimensions. For example, the wall thickness of a sleeve and the overall length of that sleeve. Aspect ratios of 50:1 or higher have been molded by ATS in high volume using our proprietary feedstock. The image below illustrates a part with a 0.3mm wall thickness and an overall length of 20mm. That is an aspect ratio of over 66. Aspect ratios over 10 or 20 are considered high in ceramic injection molding. Producing our own feedstock is one of several reasons why ATS is capable of routinely molding very high aspect ratio parts on a daily basis. Bring us your most challenging parts; ATS will find a way to mold what you need! These days it is even more important to get the most out of your tooling investment. ATS and EverFab have designed and produced "family tools" on numerous occasions as an effective way to keep the tooling cost down for our customers. A family tool can mean a number of things. The following are three different types of family tools utilized at ATS. First, there is the possibility of putting numerous parts in the same tool and in the same location in that tool by simply interchanging certain components. For example, the image below illustrates a family of parts that required only a simple core pin exchange in order to produce a part with four different exit-hole sizes. Second, it is also possible to put two very different parts in the same tool and in the same location by interchanging several components. Even if the parts are different sized, it is still possible to utilize a single tool location. The parts below were both made in the same tool and same location in that tool for the same customer. The volumes were such that the two parts could share the tool without creating production conflicts. Third, even if the parts are significantly different and cannot share the same location in a tool, it is possible that they can share the same tool by utilizing different locations in that tool. There are still some size constraints but, as you can see from the image below, two very different parts can share the same tool for the same customer. ATS takes tool utilization very seriously and we will provide all of our customers with the most cost effective tooling solutions possible. Perhaps our specialty at ATS is the ability to integrate shaped holes into complex advanced ceramic product. Access to some of the most sophisticated tooling in the world has allowed us to produce small, precise holes of many different and unusual shapes. 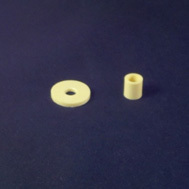 The three images below are examples of just some of the uniquely shaped, as-molded holes produced by ATS for products used in various industries. Try machining these shapes in fired advanced ceramic. If you need a shaped hole in advanced ceramic, contact ATS and let us show you what is possible with our injection molding. Call us or use the link below to contact us! ATS routinely molds advanced ceramic components with holes as small as 100um in diameter in high volumes. 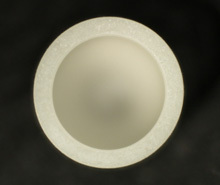 The image below is the as-molded working end of a zirconia applicator with a 100um hole. ATS is also working on tooling to mold this same applicator with a 75um and 50 um hole. ATS prides itself on pushing the limits of tool design and construction techniques in order to provide our customers with product that meet or exceed their specifications. As the world continues to get smaller, ATS will continue to find new and innovative ways to meet the challenges that await us all. External threads are easily accomplished by ATS via injection molding in any of our advanced ceramics. The threads are ground into the steel mold with the shrinkage factor taken into consideration. The part is molded and removed either by parting the mold down the length of the threads or by utilizing an expandable core. 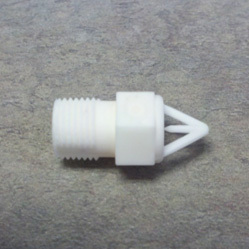 The image below is an atomizing nozzle with 1/8" NPT external threads. Internal threads are also easily accomplished at ATS using any of the dozens of different feedstock via injection molding. The most common way to thread an ID is using a removable core and turning the core out prior to removing the part from the mold. 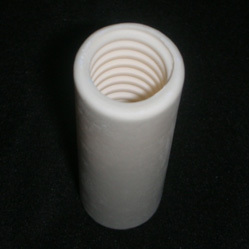 The image below is an alumina sleeve with the ID threaded. ATS is capable of molding almost any thread size in any advanced ceramic. We can also provide threading of critical features using a post-fire grinding operation if needed. If you have a challenging part with threads and you are unsure about injection molding, send us your drawing using the link below and let ATS find you the right solution. ATS has produced feedstock from dozens of different materials over the years. If there is a source for refined powder, it is very likely that we can make a feedstock for injection molding at ATS. All the feedstock is produced at our manufacturing facility in Alpharetta, GA. The variety of materials possible is virtually endless. 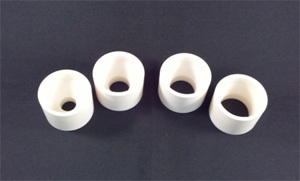 First, there are several common high performance advanced ceramics like alumina and zirconia. These materials are readily available, relatively inexpensive, and very consistent from the suppliers. We produce and mold alumina and zirconia every day and have numerous grades available to best suit your needs. There are also less common advanced ceramics like titanium diboride, boron carbide, silicon carbide, aluminum nitride, and ESD materials (electro static dissipative) just to name a few. These raw powders are also readily available and very consistent from the suppliers. These materials are designed for very specific requirements such as high thermal conductivity or high impact resistance. Even if your requirements are unique, ATS will help you find the right advanced ceramic solution. 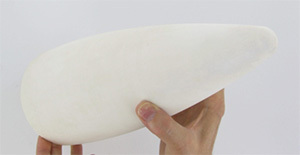 Then there are composites of advanced ceramics. Composites can include almost any combination of powders to produce specialized properties. These materials may also include fibers, whiskers, or other forms of advanced materials. ATS has reliable sources for hundreds of materials and they are readily available. ATS has also produced custom feedstock requested specifically by our customers. Whether you have your own source of raw powder or you need to specify a unique material ATS is capable of providing you with your exact solution. Even if you are not sure of the exact material, ATS can help you find the optimum solution. ATS's proprietary know-how in producing feedstock has allowed us to provide product ideally suited for your application. Give us a call or send us your requirements by clicking the button below.